Nike has announced the release of the KD V N7 for 2013. The KD V N7 will drop Friday April 13th 2013. This will be the first time the N7 collection will be available at retail locations as nike partners with Foot Locker. 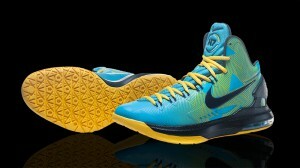 You can pick up the KD V N7 on 4/13 at select foot locker and house of hoops locations and nike.com via shared link on the Nike N7 twitter account. Click here to find out if the KD V N7 will hit your local Foot Locker. Air Jordan Retro 1 OG Black/Metallic Gold Release info posted.